For Apu Mishra and Tamara Schmautz, words wouldn’t be enough. To really get their message across, they would need a paper shredder. 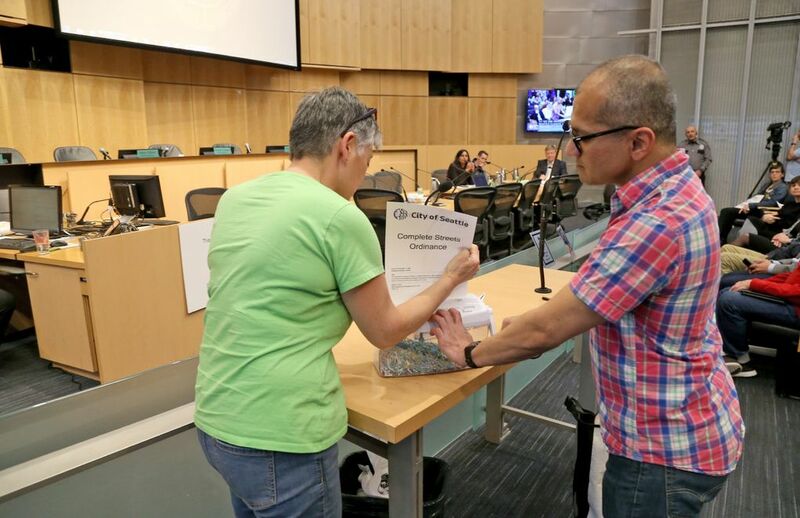 During public testimony before the Seattle City Council’s transportation committee Tuesday, the two bike advocates carried with them to the front of council chambers a small shredder and used their time at the microphone to feed into the machine copies of the city’s bike, climate and “complete streets” plans. 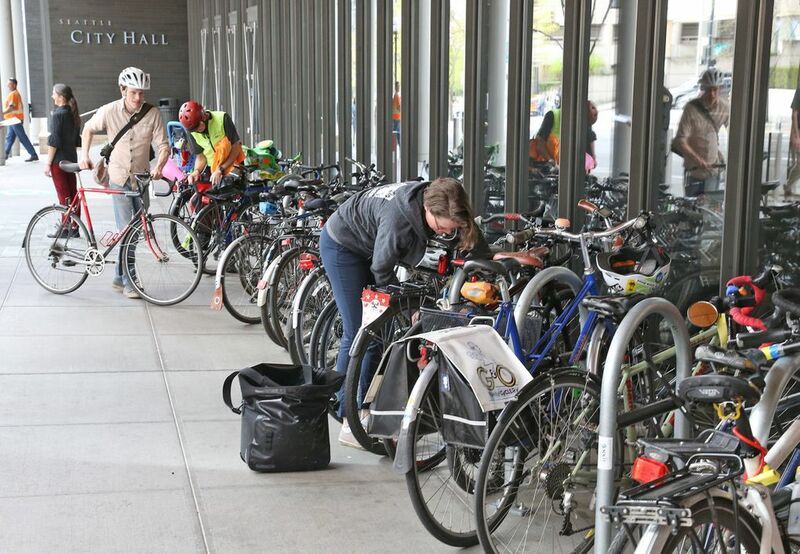 It was a theatrical display of opposition to a new proposal from the Seattle Department of Transportation (SDOT) that would remove 34 bike projects from the agency’s near-term work plan. SDOT presented the plan, still labeled as a draft, to the council Tuesday. The changes to the plan come on the heels of the city’s decision last week to forgo bike lanes on 35th Avenue Northeast. Meanwhile, a recently released report shows dismal progress on protected bike lanes under Seattle’s $930 million Move Seattle levy. To some advocates and City Council members, it’s mounting evidence of a mayoral administration unwilling to spend political capital on bike safety, even as City Hall urges people to bike and walk amid worsening congestion and climate change. Mayor Jenny Durkan has shown a “complete disinterest” in improving cycling infrastructure in the city, Seattle City Councilmember Mike O’Brien said in an interview. In a statement, Durkan defended her commitment to bike projects and said those SDOT will build in the coming years will be “transformative.” She cited a protected bike lane on Seventh Avenue finished last year, initial work on a greenway in Rainier Valley and free-floating bike share programs. “As Seattle grows, we must — and we will — continue to build a connected bike network for all ages and abilities,” the mayor said. As with many transportation projects in Seattle, progress on bike lanes is tied to the fate of the city’s troubled Move Seattle levy. The levy, passed by voters in 2015, promised 50 miles of new protected bike lanes and an additional 60 miles of slow streets known as greenways. But the measure underestimated the cost of building the projects, including bike lanes. Last fall, SDOT came up with a new work plan for the levy but was short on specifics for bike projects until now. Under the latest version of SDOT’s plan, the agency says it would spend about $77 million over the next six years, most of that from the levy, to build or design 62 new miles of bike facilities, including bike lanes and greenways. SDOT says it has built about 27 miles in the past three years. On the chopping block would be about 26 miles of projects identified as lower priorities or that face funding problems or other issues. The projects removed from the plan range from short segments like a protected bike lane on Valley Street in South Lake Union and a missing piece of the Chief Sealth Trail near Othello to longer bike lanes planned for Greenwood Avenue North, Beacon Avenue South and North 130th Street. A half-mile bike lane to help connect neighborhoods to the future Northgate light-rail station would be pulled, as would the just-scrapped bike lanes planned for 35th Avenue Northeast. Those projects would remain in Seattle’s long-term bicycle master plan but are not expected to be built between now and 2024, the year the Move Seattle levy expires. New funding or cost savings could revive delayed projects, but that is not certain. SDOT blames a variety of factors for project delays, including contracting constraints in a hot construction market. The Durkan administration also has emphasized the need to restore public trust after problems emerged with the Move Seattle levy. The plan sorts projects by risk, casting uncertainty on some promised projects because of issues like federal funding, coordination with other agencies and parking impacts. “We wanted to make sure we’re clear where there are challenges out there,” SDOT Director Sam Zimbabwe told council members. Councilmember Teresa Mosqueda said there’s a risk in abandoning projects, too. The city’s progress on bike infrastructure is crawling under the Move Seattle levy, reports show. In 2018, Seattle built about 2.3 miles of protected bike lanes, less than a quarter of the planned 10.4 miles, an annual levy report says. Progress on greenways was behind, too, with about 7.9 miles completed, compared to about 12.5 miles planned. Meanwhile, SDOT reports a 12 percent bike-ridership increase from 2017 to 2018, based on bike counters at five locations throughout the city. Taylor is a member of the Seattle Bike Advisory Board but was not speaking on behalf of the group. More bike projects are scheduled for 2019, but many of them are leftover. While SDOT plans to build about 12 miles of protected bike lanes and greenways under the levy this year, most are projects carried over from 2018. SDOT plans to build about 1.4 miles of new protected bike lanes in 2019, in addition to the carry-over work. The department plans less than one mile of new greenways, plus the carry-over. “This rate of progress is unacceptable,” the Move Seattle Oversight Committee, which monitors the levy, wrote to the mayor and City Council last month. While Seattle city leaders have adopted Vision Zero, a plan to eliminate traffic-involved fatalities and serious injuries by 2030, the numbers have been largely stagnant in recent years. In 2018, 393 crashes involving bikes were reported, down slightly from 426 in 2014. But there were 29 serious injuries and one fatality involving bikes last year, exactly the same as in 2014, SDOT says. 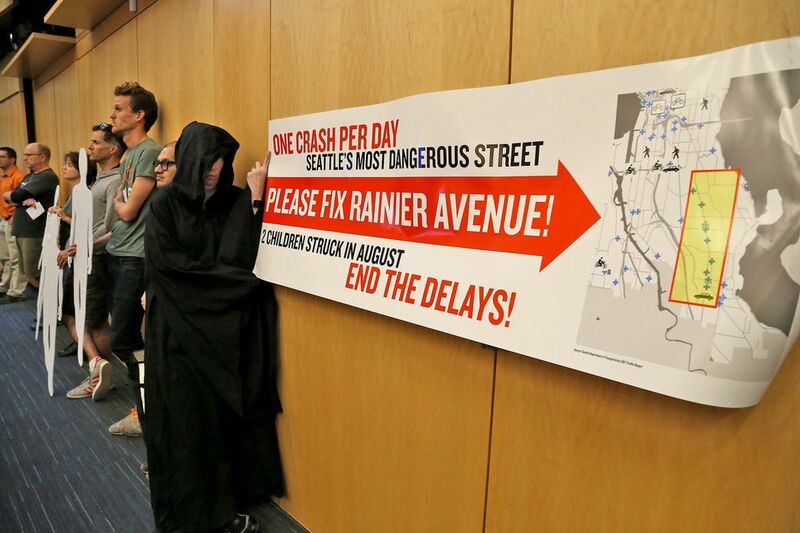 “The reality is that as we’re delaying projects and implementation of these routes, there are people out there who are getting injured and being killed on our streets,” Clara Cantor, an organizer with Seattle Neighborhood Greenways, said in an interview. “We must make the most of our available resources in the Move Seattle levy to build a bike network that supports bicyclists of all ages and ability, increase the safety of pedestrians, and advance our Vision Zero goals,” Durkan said. The coming weeks will test how Durkan’s assurance goes over with cyclists. Citizen advisory groups will discuss the plan this week, and SDOT will take public comments until April 30.